Cinnamon Crunch from Cascadian Farm Organic Kids is basically Cinnamon Toast Crunch from General Mills with a couple significant differences. The cereal pieces in the new cereal are curved and nearly half-cylindrical. This cereal isn't as crunchy as Cinnamon Toast Crunch and it doesn't taste nearly as good. In the initial spoonfuls of this cereal, you're hit with an almost wood taste. I don't eat wood as a rule, but I say "wood", because the pre-taste (when the cereal first enters your mouth) is reminiscent of the smell of freshly cut plywood. Seriously. 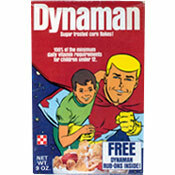 If you simply smell a handful of the dry cereal, you get an idea what I'm talking about. It smells more like a hardware store than a bakery. Does the taste of warm, cut plywood work as a breakfast cereal flavor? Not really. But the good news is that taste subsides as you eat more of the cereal and it starts to taste more like Cinnamon Toast Crunch. This new product has only a slightly better nutritional profile than Cinnamon Toast Crunch. It has 2.5 grams of total fat compared Cinnamon Toast Crunch's 3 total grams. This cereal has 0 grams of saturated fat, compared to 0.5 grams. This cereal has 2 more grams of dietary fiber and 2 less grams of sugar. The smattering of vitamins and minerals is very similar. Total Cinnamon Crunch has the best nutritional profile of all three cereals. If you're looking for flavor, stick with Cinnamon Toast Crunch. If you want this type of cereal but want more fiber, less sugar and more nutrition, go for Total Cinnamon Crunch. Unfortunately, that leaves no reason to ever buy this cereal - except to try it yourself so you can tell me that I'm right or that I'm I'm crazy in the comment section below. What do you think of Cinnamon Crunch? Delicious! It is very similar to Cinnamon Toast Crunch except not as sickening. I just dumped my Cascadian version in the trash, after two bites. Nice try, but this stuff is awful. I definitely agree that it smells like fresh cut wood. Not cardboard, WOOD. Idk. I'm eating it anyway. Better to smell like wood than chemicals, right? This cereal is great and much healthier. I am disappointed in Mr. Cereal because he seems to be unaware of differing serving sizes. This cereal is 1 cup as apposed to Cinnamon Toast Cruch, which is 3/4 and much has a much worse profile when converted. One of my favorite cereals. It's all relative. I loved this cereal because it wasn't too sweet, and it was eating a healthier version of Cinnamon Toast Crunch so it wasn't as bad to indulge in a cereal that's on the sugary side for my standards. Less calories was a plus too. I disagree Mr. Breakfast. My family loves Cinnamon Crunch, we like it better than Cinnamon Toast Crunch. The sugar grams are in line with the amount of sugar that a toddler should have in the cereal they eat, so it is much healthier too. I disagree - I think this cereal tastes better than Cinnamon Toast Crunch, it's not as sickly sweet and has a nice texture. I disagree Mr Breakfast. This was delicious. The initial taste in your mouth is skewed bc you are expecting cinnamon toast crunch in all of its refined sugar goodness. But you adjust and now I crave it just as much as i used to crave cinnamon toast crunch. Great cereal! 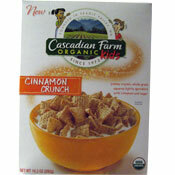 I thought Cascadian Farm Cinnamon Crunch was quite good as a breakfast. It tasted like the regular cinnamon toast crunch so why not start the day of with a healthier breakfast by just switching...and if you have been on a diets of eating healthy this will satisfy you as a good little treat. I liked it a lot. I tried Total Cinnamon Crunch last night and was pleasantly surprised. It bore some resemblance to Cinnamon Toast Crunch but did not taste like a kids' cereal. It had a more substantial texture and a level of sweetness that is adequate but not overly sugary. The cinnamon taste is very strong, so don't buy this product if you're not a fan of cinnamon. At least it has flavor. I was expecting it to taste like cardboard, the way the Fiber One cereals do. This Total's fiber content also makes it much more filling than Cinnamon Toast Crunch. I love Total Cinnamon Crunch... I've always liked Cinnamon Toast Crunch and now that there's a "healthier" version of it, that actually tastes good, I will definitely continue to buy. (on sale of course) lol...w/e happened to Rice Crispies Apple Cinnamon? That was bomb!